THE Solentiname Islands in Nicaragua are familiar to aficionados of primitivist art. Paintings by local artists depict the islands as a paradise of impossibly lush flora, exotic birds, distinctive hanging birds’ nests and people happily going about their daily lives. To visit the islands is to walk into one of those paintings. The Solentiname (pronounced so-LEN-teh-NAH-me) archipelago is a cluster of 36 islands near the southern corner of sprawling Lake Nicaragua. The islands are close enough for kayakers to paddle from one to another, but they’re far enough into the lake that a private motorboat or a public ferry is needed to reach them. Only four of the islands have full-time inhabitants, and the total population today is about 750. Yet, thanks in large part to the efforts of a Roman Catholic priest named Ernesto Cardenal, vivid art produced on the islands can be found all over Nicaragua and has been exhibited far beyond. The islands were largely unknown before the mid-1960s, when Father Cardenal, a native of Granada, Nicaragua, arrived on Mancarrón, the largest of the Solentinames, to establish a parish church. He ended up nurturing not just a political consciousness but also a community of artists that is still thriving decades later. “When Cardenal came to Solentiname, the people had nothing,” said María Guevara Silva, who was 15 when he arrived and is now an innkeeper and a working artist. “We had no schools, no boats,” she said, referring to motorboats. Most inhabitants were farmers struggling to coax crops out of the steep and rocky terrain. Father Cardenal, a sculptor as well as a serious poet, promptly set out to improve islanders’ lives by encouraging them to express themselves through art. “The first painters were me, my brother Alejandro and José Arana,” Ms. Guevara Silva said of Father Cardenal’s art project, which began in 1967. 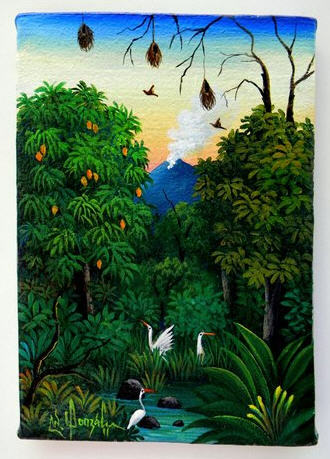 “He financed the materials and told us to paint what we wanted.” Thus was born Solentiname’s distinctive art style: highly detailed oil and acrylic paintings of idealized rain forests and watery scenes populated by white egrets, blue herons and oropendolas, the black birds whose unusual hanging nests are often seen in the paintings, too. “People discovered we could sell our paintings,” she said, both to visitors as souvenirs of the islands and to collectors interested in primitivist or naïve art. The art project wasn’t the priest’s only innovation. Masses at his open-air church were more like Bible-study sessions. He’d read a section of Scripture and invite the campesinos — the island’s poorer inhabitants — to interpret it. He started taping the services. Transcripts were assembled into a multivolume collection called “The Gospel in Solentiname,” published in Spanish in 1975 and in English in 1978 and now a touchstone for anyone interested in liberation theology. In 1977, men from the islands did just that, staging a raid on General Somoza’s National Guard post in San Carlos. The Somoza forces captured and killed a raider named Elvis Chavarría, and destroyed most of the farms and homes on the islands. Two years later, the Sandinista movement overthrew the dictatorship and Father Cardenal was named minister of culture in the new government, a position he held until 1987. He formed the Solentiname Development Association to create the tidy communities that visitors see today. Father Cardenal left the Sandinistas in 1994 and is now an opposition figure living in retirement in Managua. In addition to “The Gospel in Solentiname,” he has published a number of other works, mainly poetry, and is often described as one of the most important living Latin American writers. Jane and I stayed at Ms. Guevara Silva’s Albergue Celentiname (pronounced just like Solentiname), the first inn ever in the Solentinames, built at Father Cardenal’s suggestion to house international visitors who came to see his ministry. The inn is on San Fernando Island, officially renamed Elvis Chavarría Island, though locals are adamant about using the old name. The inn, with a large porch and the island’s best sunset views, is at the western end of a paved waterfront walkway called the Corredor de los Pintores, where many island artists are based. Visitors are welcome to watch the painters at work and, of course, to buy paintings. Small works start at around $40, with larger and more accomplished works priced at $500 and up (the United States dollar is an official currency in Nicaragua). Also along the walkway is the island’s other main inn, Cabañas Paraiso; the community dock; the island’s one small shop; and steps leading up to a small co-operative art gallery. At the eastern end of the walkway is a short but steep path to Musas, a tiny museum focusing on the natural and cultural history of the islands. Along the way you might see fishermen paddling dugout canoes or rowing small pangas. Also on San Fernando is a haphazardly marked path to a pre-Columbian petroglyph, a volcanic boulder carved with what appear to be intertwining snakes. The trail, which takes about an hour and a half with a local guide, wends through a rain forest where fantastical trees drip with bromeliads and orchids and where the sound of footsteps prompts large, colorful birds to take flight. The only other Solentiname island that has accommodations for visitors is Mancarrón, which we reached in a few minutes on the Aubergue Celentiname boat. 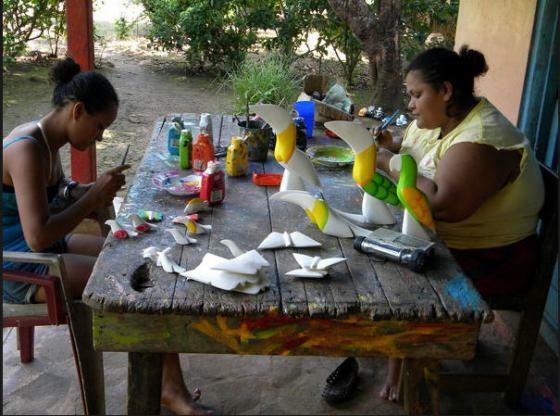 Working in a community called El Refugio, artisans carve and paint balsa wood to create colorful fish, birds, frogs and turtles. Between El Refugio and the community dock is Father Cardenal’s distinctive church, an open-air stone building with window screens painted to resemble stained glass, multicolored backless benches, a simple blocklike altar, and white interior walls adorned with paintings of fish and other animals. Also nearby is a tiny archaeological museum with some interesting pre-Columbian carvings. Mr. Alaniz told us of a trail to a waterfall on Mancarrón. “It’s a long, hard walk,” he said, looking at our flimsy sandals. We took the hint and instead climbed a little hill to Father Cardenal’s modest cabin. He was in Managua and the house was closed up tight, but we enjoyed views of Lake Nicaragua from its small deck, which connected with the similar deck of another house owned by one of Mr. Alaniz’s relatives. I was offered a cold beer, a rocking chair and a lake view while Mr. Alaniz and Jane tried to get closer looks at a couple of pacas, opossum-size animals with deerlike heads, that were hiding in hollow logs in a small pen. After returning to San Fernando for our second and final evening, we were joined on the big porch at Celentiname, where Ms. Guevara Silva displays and sells her paintings and her family’s handicrafts, by a married couple from France, a Spanish professor from Belgium and a retired history professor from Costa Rica. I asked Ms. Guevara Silva, who was swinging gently in a hammock chair, what drew tourists to Solentiname. She said some come “to see the nature” or to buy art, but most want to see where “The Gospel in Solentiname” was born. “Ninety-five percent are here because of interest in Cardenal,” she said. 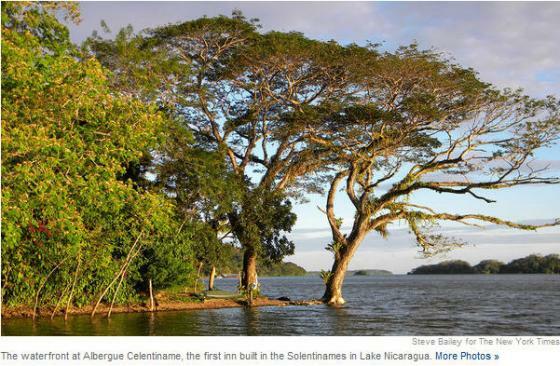 The Solentiname Islands are most easily reached from San Carlos, a small town where the Rio San Juan connects with Lake Nicaragua. There is one daily flight on La Costeña airlines (lacostena.com.ni) from Managua to San Carlos, where you can catch a 3 p.m. boat (505-8828-2243; $10) to the Solentinames. We were warned that mosquitoes made it advisable to leave Mancarrón Island by 5 p.m; we had no problem in January with mosquitoes on San Fernando. Hotels on the island offer full board, as there are no restaurants. Albergue Celentiname (505-8893-1977; celentiname7@yahoo.es) on San Fernando (Elvis Chavarría Island) offers eight bare-bones rooms, with cold-water showers in semi-detached cabins, with full board for $35 a person, based on double occupancy. Cash only. Cabañas Paraíso (505-8894-7331; solentiname.info) is also on San Fernando and a bit less rustic than Celentiname. Its 14 large rooms also lack hot water. Rates are $45 per person per day, based on double occupancy, and include three meals a day. Major credit cards accepted.